German singer-songwriter Gregor Meyle has been a Hear the World ambassador since July 2018. 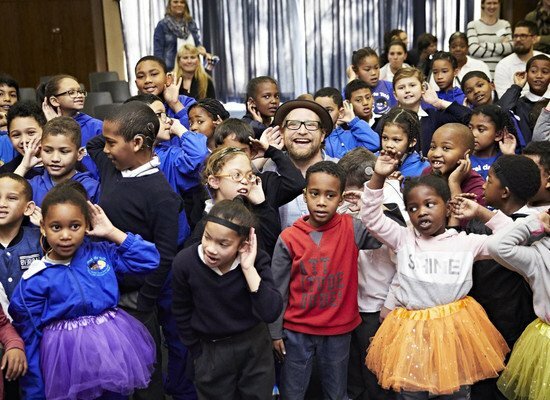 During his visit to a project in South Africa in July, he met children with hearing loss at the Carel du Toit Centre and sang with them as part of a musical speech therapy session. This likeable full-blooded musician talks about his experiences and impressions that he had during his stay in South Africa. Gregor, you spent four days in Cape Town, South Africa, as a Hear the World ambassador. How was it? It was impressive and a very important experience that will resonate with me for a long time. I was totally impressed by the beauty of the country, but at the same time I was also very moved by the glaring social contrasts. Which moment do you remember most clearly? Definitely the encounters with the children; but also, the exchanges with the many volunteers on site. They show so much commitment and compassion. I find that deeply impressive. You were there when a child became able to hear for the first time. What was that like for you? That really touched my heart. It’s so wonderful that I had the opportunity to be there. What was your impression of the children in South Africa’s townships? They’re highly musical and tremendously brave. They radiate a very special lust for life and just want to be children. How did the music session with you help the children? Their reservations disappeared in a matter of seconds. We then sang, danced and laughed a lot together. It was an experience that I’ll never forget. What made you decide to become a Hear the World ambassador? I’m a musician. My ears are my most important sensory organs. With my music and my high profile, I can help to get this valuable project out into the world. It was simply a good fit. What more can we expect from you as a Hear the World ambassador? Will you be involved in other projects? I hope that I can help to promote Hear the World as an ambassador on a long-term basis. It was a beautiful trip to the other end of the world, which raised my awareness of many things and made me more grateful. What does good hearing mean to you as a musician? My hearing is my most important tool. I use it to provide for myself, my own family and now a large team of people who rely on me. I hope that I’ll continue to have good hearing for a very long time. As an ambassador for conscious hearing, what is your advice to concertgoers with regard to hearing protection? I take my hearing protection with me when I go to concerts. It can’t do any harm. Gregor Meyle will be on tour again in fall and winter, raising awareness for conscious hearing. The tour dates can be found here.